Welcome to my review of the Vanguard Endeavor ED 8×42 Binoculars. This set of binoculars features 42mm objective lenses with enhanced edge-to-edge view quality, and uses Vanguard’s ED lenses for optimal color dispersion and image quality. Let’s take a closer look, and see how they stack up to the competition. Vanguard has definitely paid attention to detail on the included accessories, including a very comfortable neck strap and lens covers that fit very well over the eye pieces and won’t accidentally fall off. The only problem lies in the carrying case: it’s a bit too snug, meaning quick retrieval of the binoculars from the carrying case might not be possible. How Much Magnification Do I Get? The magnification on these binoculars is 8X, with 42mm objective lenses to ensure a terrific field and depth of view. The binoculars bring even the smallest bird up close and personal, allowing you to watch birds or scout out hunting territory with ease. These binoculars are also great for sporting events, zooming you in so close you can almost count the threads on the seam of the baseball. What Type of Optics Do the Binoculars Have? Vanguard has designed the Endeavor ED with Bak4 roof prism optics, using premium ED glass for greatly reduced color dispersion and excellent resolution and quality. While you won’t get the brighter images in low daylight that a porro-prism lens would give you, these binoculars are still quite good at gathering light and presenting you with a fantastic image. The optics are fully multi-coated, and the binoculars are nitrogen-charged to ensure a fogproof experience during all weather conditions. Vanguard knows what they’re doing here, and they’ve built a set of binoculars that is weatherproof, waterproof, and fog proof. A few of the nicer features of this set of binoculars is the large focus adjustment wheel, the 3-stage twist eyecups, and the locking diopter ring. If you wear eyeglasses, you probably know how difficult it is to find binoculars that are comfortable to use with your glasses, allowing you the full field of view without losing part of the image or struggling with focus. The 3-stage twist eyecups take the pain and heartache out of that, allowing you to adjust the binoculars to your own personal eye relief preferences, and the locking diopter ring means you won’t accidentally adjust the diopter while handling the binoculars. The large focus adjustment wheel makes it easy to focus, giving you the best, sharpest image you can hope for. These binoculars provide a 7o viewing angle, giving you a field of view of 400 feet at 1,000 yards. This is a good field of view, allowing you to scout around for what you’d like to focus in on with ease. Whats the Body Like On These Binoculars? The Vanguard Endeavor ED has an open bridge design, and provides an ergonomic grip with a thumb rest. The chassis is solid and durable, but only weighs 730g. The exterior surface, other than the two thin bridges, is covered in a thick, tactile rubber armoring with an excellent texture to it to help provide you with a secure, non-slip grip on the binoculars. Here’s a really nice available extra: Vanguard manufactures a tripod adapter mount that works perfectly with these binoculars. If you want to set up your binoculars on a mount, you can do so quickly and easily, allowing you to zoom in on a subject and then just leave the binoculars stationary for others to have a look. How Durable Are the Binoculars? With the rubberized armor, these binoculars are fairly durable and capable of withstanding the normal bumps and jostles that you might expect when carrying a set of binoculars around your neck. The open bridge design makes it easy to keep a grip on the binoculars when the bumping gets to be too much, and the nitrogen-charged chambers keeps you fog proof and weatherproof no matter what the outdoor weather conditions are like. In a nutshell, these binoculars feel like the premium quality sporting equipment that they are, and they are covered by a lifetime warranty to ensure you have years of fantastic use from them. Thanks for reading my review of the Vanguard Endeavor ED 8x42 binoculars. 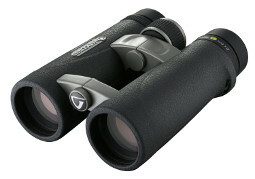 These binoculars are a great value, and will provide years of use. Whether your interests lie in birdwatching, hunting, or sporting events, these binoculars will definitely fit the bill and provide you with the image you want and need.